A female velociraptor and her five babies are hunted by a team of scientists. 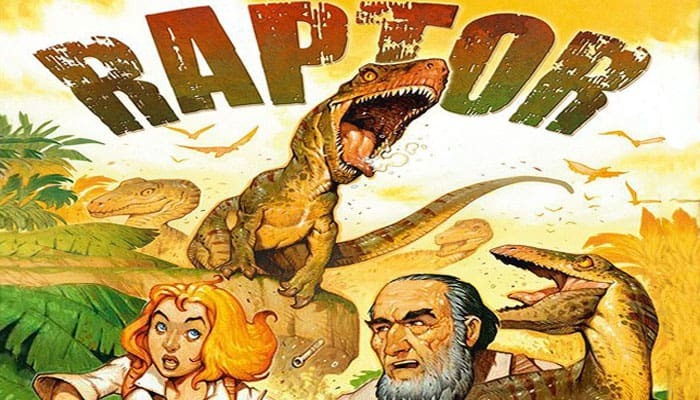 The player who controls the raptor family can win by killing the scientists that are after her, or by allowing three of her babies to take shelter deep into the jungle where nobody will ever find them. The player who controls the scientists has to neutralize the mother or capture three of her babies. and 4 L-shaped tiles with 3 spaces and one exit (half-space). The two sides of the board components offer a different atmosphere. 9 Rocks (made of 2 parts). Choose one of the two atmospheres for the game (jungle or savannah). This choice must be applied to all ten tiles of the board (tiles will therefore be either all jungle, or all savannah). Place the 6 square tiles randomly, forming a 2-by-3 rectangle. Place the 4 L-shaped tiles randomly along the shortest sides of the rectangle you created in step 2. Place the 3D rocks on each of the spaces that do not show a circle or half-circle. The Raptor player starts placing the raptor figurines on the board, followed by the Scientist player. The Raptor player places the mother and the babies on the board. The mother raptor is placed on one of the two central tiles 2. The 5 baby raptor are distributed on the board, one on each of the remaining tiles 3. The Scientist player then places one scientist on a space of his choice on each of the 4 L-shaped tiles 7. The remaining 6 scientists are kept in reserve next to the player aid 8. Each player shuffles his deck of Action cards and places it in front of him. 9 9. Then, each player draws the first three cards of his deck and takes them in his hand. 10 The first round can now start. There can never be two figurines or tokens on the same space. Two spaces are considered to be neighbors if they are orthogonally adjacent. Diagonal adjacency is never taken into account, neither for moving, nor for shooting. The half-spaces are the exit through which the babies have to escape. No other figurine or token (the mother, a scientist or a fire token) can be placed there. The only way a baby can move on such a space is by using the "A baby raptor moves one space" action. Each player chooses one of the three cards they had in their hand and places it face-down in front of themselves. Both cards are then revealed simultaneously. If both cards have the same value, they are both dis- carded and have no effect. In most cases however, both cards will have a different value. In that case, the player who played the card with the lowest value goes first and applies the effects of his card (effects must be applied, if possible). Then, his opponent will be able to spend a number of action points equal to the difference between the values of the two cards. Important! The player who receives action points- does not apply the effects of the card he played. The Scientist player played card 2: "Reinforcements"
The Raptor player played card 6: "Disappearance and observation". The Scientist player played the lowest value. He applies the effect of his card and adds two scientists on the board. The Raptor player can now spend 6 - 2 = 4 action points that he can use on either the mother or the babies that are awake. Each player draws a new card so that they have three cards in their hand, and the game continues with a new round. Round after round, the played Action cards are placed visibly in front of each player, so that the values that have already been played can be seen by the opponent. If a player empties his draw pile, he keeps the cards he has in his hand, shuffles the discard pile to create a new draw pile and then draws up to complete his hand with three cards.